​The students at the two schools I visited in the Philadelphia area on October 25th (see Junior Flower Show tab) had excellent questions about orchids and their care. I decided to address some of them over the next few months here. One of the hardest, and most tedious, things to do is watch a bud spike develop. Once you see that bud spike appear, it seems as if the flowers should be opening in a week or two. Sadly, this is not the case. It can actually take 6 to 8 weeks for a bud spike to develop and the buds begin to open. I have a new bud spike which has just appeared on my Sedirea japonica. Over the next several weeks, I will provide a time-lapse photographic record of this bud spike development. The photo at the right shows the bud spike after 2 weeks of growth from its first appearance. The orchid itself is 3 inches high and 8.5 inches wide. The bud spike was .5 inches long. The Sedirea genus has an interesting history. The orchids in this genus were originally in the Aerides genus. In 1974, two species in the Aerides genus were segregated out because of certain physiological differences in the column and lip shape. They were moved into the newly created Sedirea genus (Aerides spelled backwards). These two orchids are now called Sedirea japonica and Sedirea subparishii. Sedirea subparishii is native to South China and Sedirea japonica is one of the few species native to Japan, as well Korea and the Ryukyu Islands. How Much Sunlight Does My Orchid Need? This was another excellent question I received at my Junior Flower Show talks. It’s a simple question with a very complicated answer. With over 28,000 different species of orchids that live on every continent in the world except Antarctica, there is no single answer to this question. Even orchids within the same genus require different light levels. I tell the people who attend my talks and classes that providing the correct light level for your orchid is probably the most important thing you can do. Light is the driver for photosynthesis which provides the carbohydrates for the plant to grow and bloom. ​Without sufficient light, the orchid cannot thrive. It may grow but won’t waste its limited resources on blooming. However, when an orchid gets too much light, it will dissipate the excess light as heat which scorches its leaves. So, too much light will kill the orchid. If you are preparing to buy new orchids, my suggestion is to ask the grower what light levels he recommends for the specific orchid you are buying. If you are looking for care instructions for orchids you already own, then I have two suggestions. First, look up the light requirements for the genus and use this as a general guideline; and second, let the orchid tell you if it needs more or less light. Chlorophyll is green in color. If your orchid is getting the right amount of sunlight, the color of its leaves will remain pretty much constant. If your orchid is getting too little light, it will send more chlorophyll into its leaves in an attempt to use all of the available light. This process causes the leaves to become a darker green. Conversely, if your orchid is getting too much light, it will pull chlorophyll from its leaves making them lighter green or even yellow. 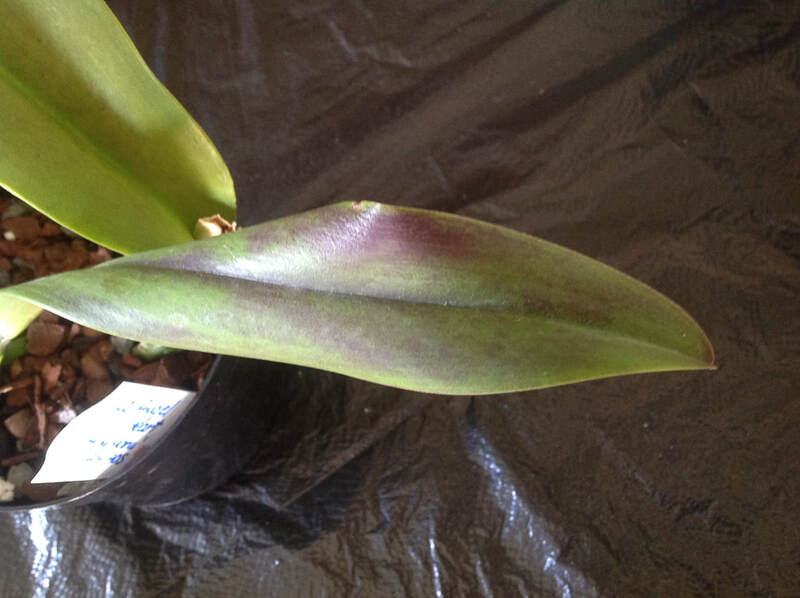 In extreme cases of too much light, the leaves or pseudobulbs can “sunburn” and turn red or the leaves can develop dried, white patches where it has been scorched. What Is a Phalaenopsis Orchid and Where Does it Come From? I was asked what a Phalaenopsis orchid is and where it comes from. Excellent questions! Phalaenopsis is Greek for “phalaena” meaning moth and “opsis” meaning resembles. These orchids are thought to have gotten their name because they resembled the obsolete genus of large moths called Phalaena. This is why they are known as the “moth orchid”. There are about 60 species of Phalaenopsis orchids. Most of these orchids are native to the topical* areas of southeastern Asia, China, Taiwan and down into northern Australia. The great majority of Phalaenopsis orchids are also epiphytic (meaning “lives in the air”) plants attached to trees or rocks in the shade under the canopy. Phalaenopsis orchids have a monopodial (“mono” meaning one and “podial” meaning base) growth habit. This means that they grow upwards on one stem. New leaf growth appears at the top of the stem. The leaves on Phalaenopsis orchids are medium green to light green in color, lobe shaped and often larger and thicker than the leaves of other common genera. This is because monopodial orchids use their leaves, as well as their stem and roots, to store water and nutrients. As orchids go, Phalaenopsis orchids are very adaptable and accommodating. They can tolerate a wide range of temperatures and humidity. They are shade orchids, so they’re perfect for a home setting. On average, a Phalaenopsis orchid in a 3-inch pot will need to be watered about once per week, depending upon the humidity where it’s growing. See the science lessons attached to the end of the Junior Flower Show tab for a diagram of a Phalaenopsis orchid. *NOTE: For those of you who may not know exactly what a “tropical” climate or biome is, my Everything Orchids Blog will have a post on this in the next week or so.